The city of Dynaster is in ruins – an erupted volcano has flooded it with lava, and as a result, an evil government corporation has bought the land to level it into a hellish lava-moat-surrounded fortress. But it’s okay. You have a pogo stick. Not just any pogo stick, either: it’s a Dynapogo! It has a stick of dynamite attached that remains intact when it explodes, allowing for infinite reuse. It explodes on contact with anything, so make sure you’re pointed the way you want to go when you land! 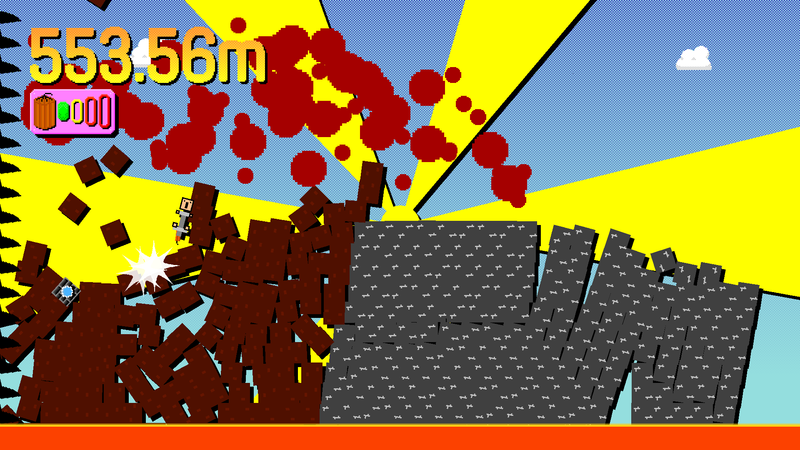 Get as far as you can by exploding your way across the doomed Dynaster cityscape’s rooftops. Watch as the final helpless and stranded Dynasterians are torn apart by the government’s leveller, making sure you aren’t killed by itself. And for the love of god, avoid the lava! + Game runs at 1080p and is fullscreen now – clearer graphics and no accidental clicking off-screen! Windows Vista, Windows 7, Windows 8 or Windows 10: 512 MB RAM, 128 MB Graphics, Screen Resolution over 1024 x 768. 10 MB disk space. Managing Director, designer of over 600 fonts and creator of over 100 independent games.